Thongs, a photo by TinCanDaisy on Flickr. Somebody took my left thong and hid it. 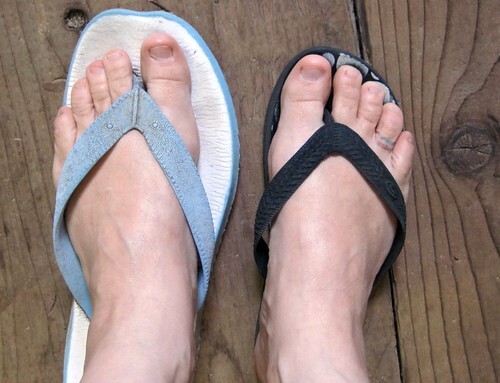 Somebody took DH's left thong and hid it too......thankfully I only had to wear this mismatched pair to the letterbox. Nobody saw me which was good. But then everyone around here knows I'm a bit quirky so they probably would have just assumed I was trying out a new look and then I would have tried to explain, which would have made it worse because I get flustered when I'm embarrassed and trying to defend myself. And then they REALLY would have thought I'd chosen to wear odd thongs. Now that I look at my feet I can see how badly I need to let my toe nails grow. I cut them super short for some reason and I need to stop it. Painted nails would be so much cuter.